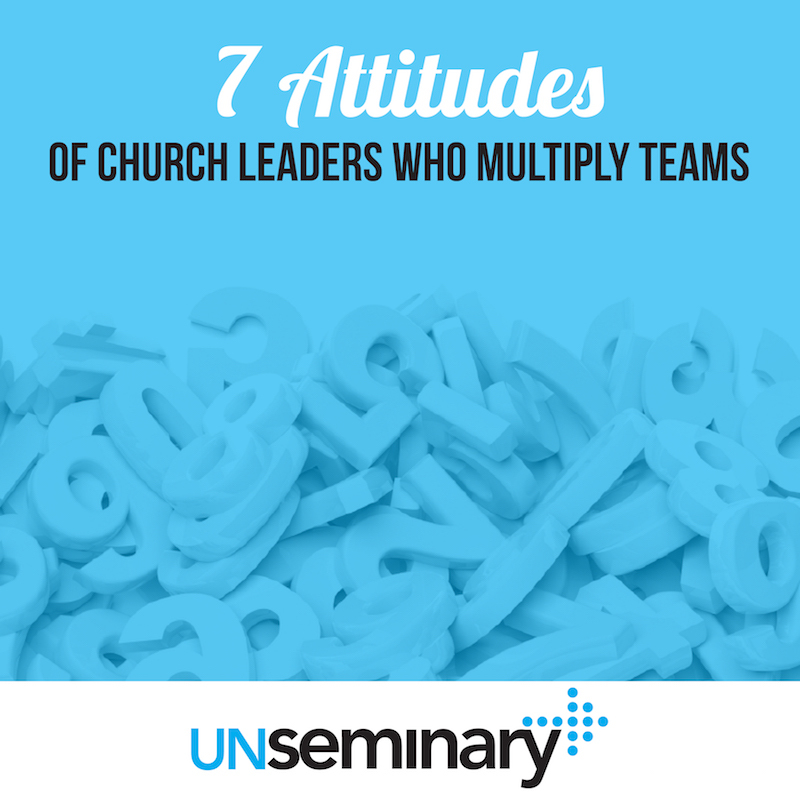 In order for your church to have an increasing impact in your community, your leaders need to understand how to multiply teams. In fact, one of the biggest barriers to growth for churches is senior leaders who don’t train, release and reward other leaders. Spend time around the leaders of growing churches with increasing impact and you’ll see people who have been very good at empowering others to lead the ministry. Let’s do this together. // No leader photocopies alone. Leaders who are great at multiplying their impact understand that everything they do — no matter how small or large — needs to be done with help from others. The more you hold on to as a leader, the less you are able to multiply. Great leaders work alongside others because they know it’s the best way to start passing responsibility on to them. How often this week have you found yourself doing something alone in your ministry? How could you have added community to those moments to start training others? Listen to this conversation with Joshua Mauney from Turning Point Church to find out how he releases leaders into ministry. What’s your dream? 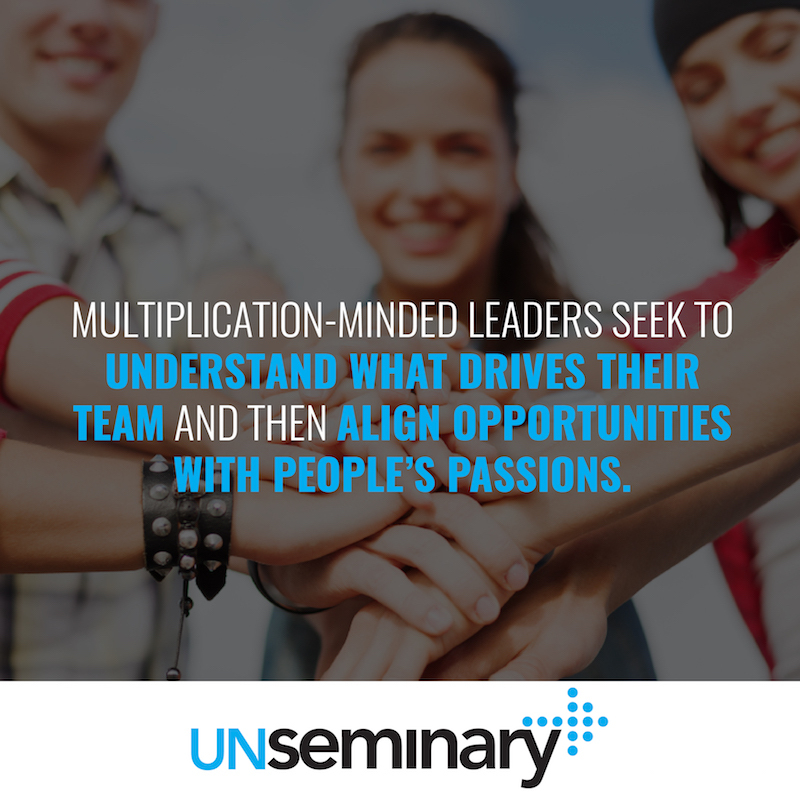 // Multiplication-minded leaders seek to understand what drives their team and then align opportunities with people’s passions. Connecting what your church is doing with what fuels people is a masterful move that drives deep engagement and empowerment. This used to be seen in ministry models where pastors agreed to every new sub-ministry … often those churches bragged about having 101 different ministries. Although thriving churches today often have a more “Simple Church” approach, we still need to find ways to connect deeply with what drives people. This requires leaders to slow down and get to know their team. Connect the dots between what your church is doing and what fires up your people. Check out these tools for understanding how your people tick. I’m so thankful for you. // Leaders who release others into ministry are deeply thankful for their team and let them know it on a regular basis. They understand that people have a lot of options and are honored when others choose to serve alongside them. They structure their time, money and efforts around thanking people. Often multiplication-minded churches have parties and team t-shirt giveaways, and they talk from the stage about what an amazing job their volunteers do. Empowering ministry leaders reward their teams because they know that people are attracted to thankful leaders. They go out of their way on “game day” to stop and thank people for being a part of what God is doing. They aren’t too distracted by the activity of a busy church to understand that it’s all happening because of individuals choosing to serve and lead. People gravitate toward where they feel most appreciated. Looking for ways to show appreciation to your team? Drop by this link to see over 30 different quick and easy ways to thank people this week at your church. God is calling us there! // Antoine de Saint-Exupery noted, “If you want to build a ship, don’t drum up people to collect wood and don’t assign them tasks and work, but rather teach them to long for the endless immensity of the sea.” People follow people with vision. Clearly articulating the “win” builds teams of people who are motivated to move in the right direction. People want to see their own lives as part of a larger story and a clear vision helps that happen. Also, you can’t train for every possible scenario that a leader will face but a clearly understood vision helps other leaders make “on the fly” decisions in light of the larger vision. A clear vision is like the North Star to sailors of old … it becomes a reference point that guides their direction. We did an interview with Will Mancini on break-through clarity that could give you ideas for articulating what God is calling your church toward. In another interview, Terry Parkman from River Valley Church helps us understand how to use systems to gain traction on your vision. I’d like you to do this big thing. // Multiplying-ministry leaders don’t shy away from asking big when they are building their teams. Too often, we opt people out of serving in significant ways because we don’t ask big. We think we’re doing people a favor because we don’t want to burden them. There are willing and able people in your church who are just waiting to contribute in significant ways — you only need to ask them. Don’t apologize for asking. Instead, call out what you see in them and ask them to step up to serve in a big way. Frank Bealer from Elevation Church does a superb job of challenging his people to step up. Listen to his talk from the Ministry Momentum Summit where he explains how to define what you need for your team. This is what we want. How you get there is up to you. // Leaders who empower others focus on results — not activity — when they communicate with their teams. Rather than defining every step of how something needs to be done, they clearly define what the “win” is and let people figure out the best path there. Some leaders smother people with detailed step-by-step instructions on what needs to be done because they’re convinced they are the only ones who can do what needs to be done. Leaders who multiply understand that if others can get 60% of the “result,” they should hand over those things and move on to other aspects of the ministry. You need to let go of how things get done and define the output you’re looking for instead. If you give people a task list, they will become unmotivated and ultimately move on to other environments where they have more ability to define their own work. I love how Kevin Negaard uses numbers with his team to motivate results rather than just activity. How are you doing? Really? // Empowering leaders care for people. They slow down and understand how people are doing for real. They ask open-ended questions about what’s going on and stop to listen to what people say. They don’t see people as “units of production” who are getting things done in the ministry but as the individuals God is calling them to be. In fact, as a church grows and has an increasing impact, the senior leaders should take more time to pray for and listen to people. Rather than getting caught up on the treadmill of ministry, they step off and focus on individuals and care for them. Our people are not servants who build our empires but God’s children whom we have the honor to serve alongside. Check out these pastoral care tips for non-pastoral care types if you need some help in this area with your team.